Carvana’s story highlights the colliding dynamics of UCaaS and CCaaS. RingCentral held its second annual Connect Central customer and partner event in San Francisco in late October, and paired it with its first industry analyst meeting. The news earlier in the week that Cisco had acquired BroadSoft only intensified the discussion of the colliding dynamics of the unified communications as a service (UCaaS) and contact center as a service (CCaaS) markets. While there, I had the opportunity to speak to a few of RingCentral's customers that have deployed both the company's UC and contact center solutions. One particular story -- Carvana -- highlights the blurring lines between full-time contact center agents and other job titles that can benefit from some of the functionality CCaaS offers. Carvana is a digitally-transformed way to buy a used car. As described on their website, Carvana offers a car buying experience for today's world: completely online, done from the comfort of your home, on your own time, with delivery right to your door. First you search online for a car. Listings include videos of the vehicles, inside and out. Once you have chosen a vehicle, you step through financing options, trading-in a vehicle and insurance details. If you are within a growing number of local markets, you are eligible for free delivery. If you don't live near a Carvana location, there's a fly-and-buy option. You fly to a car vending machine location where Carvana arranges white glove transportation to pick you up at the airport and take you to its state-of-the-art car vending machine (shown in the photo). Tim Beuden, the IT infrastructure manager with whom I spoke, said the company has been called the "Amazon of car buying" -- and I can understand why. To review, RingCentral has two contact center solutions. RingCentral Contact Center is a white-labeled offering of inContact's CCaaS portfolio. Two-and-a-half years old, the relationship between the companies has been increasingly successful for both. It has given inContact a solid channel partner and RingCentral a best-in-class CCaaS offering. Live Reports, as described by Dave Michels at the time it was announced, provides a contact center-like, real-time dashboard view into call volume, employee availability, hold times, and more. In addition, the solution is mobile-ready. Using both of these RingCentral contact center solutions, as well as the UCaaS Virtual Office application, Carvana enhances its digitally-transformed buying experience with equally unique customer care. RingCentral Contact Center is used by approximately 200 people with the title "advocate." The use cases are typical customer support: If a car is being delivered, a customer may call to find out the reason for a delay. Or a customer might call to find out if the vehicle title and registration process is complete. The Live Reports solution is used to measure and monitor the communications activity of employees who work at delivery hubs or car vending machine locations. At these locations, customers bring a trade-in or take delivery of a vehicle. At each hub, there are 16 to 25 employees. Live Reports helps Carvana measure who is delivering the most cars, who is responding to customers, who is on the phone a lot, or who is working the most with customers. Virtual Office was deployed to Carvana locations nationwide to help create a single Carvana brand and experience for customers. One example is when drivers are delivering vehicles, they need to look like they are coming from one central business. Having the RingCentral Virtual Office application on their mobile phones allows their caller ID to display "Carvana," not an unknown driver name. One of the attributes of the RingCentral solutions that Carvana really values is the data and analytics. Carvana has a large data science team, and the data from RingCentral is "crunched" with data from the Carvana website in real-time and displayed in executive offices at multiple company locations. "We have monitors everywhere that show all the current stats, updated within seconds, every day," Beuden explained. 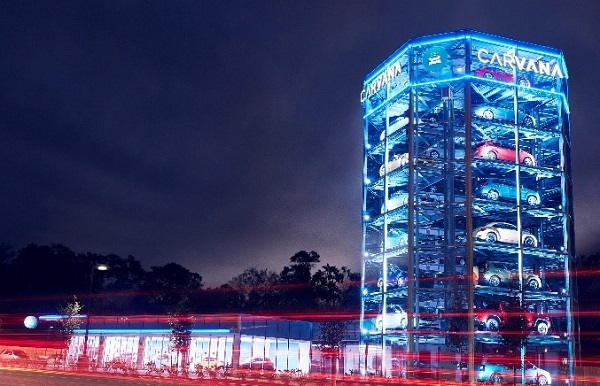 Carvana was initially designed as a companion business to a traditional used car business. The intent was to appeal to Millennials "because they are always on a mobile phone, always on an iPad," Beuden said. But what the company has found is that it has buyers of all ages, with the most typical age-group 40-to-50 years old. In business just three years, the company is already starting to get repeat customers. Another proof point that Web and mobile app-driven ecommerce is replacing retail for all demographic groups. Carvana's creation of a digitally-transformed business is aided not only by cloud-based unified communications and contact center solutions, but the Live Reports analytics that allows them to help drive efficiencies into the business for certain employees. It's a great example of enterprise communications user requirements being on a continuum, from simple to complex, not just UC or CC.